Welcome to our preview of the match of Dindigul Dragons Vs VB Kanchi Veerans 12th match of TNPL. 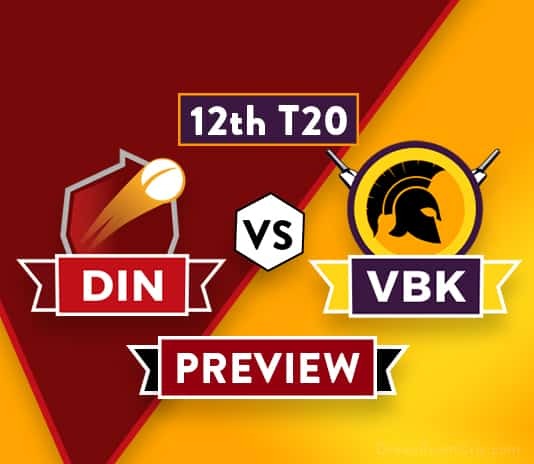 We are covering DIN Vs VBK Dream11 Team Prediction, Preview and Probable XI. The match is to be played at the NPR College Ground, Dindigul. Dindigul Dragons have played Three matches [Lost 1 – Won 2], After losing their first match in TNPL 2018 they back with a bang with back to back victories, in their last match against LYCA Covai Kings DD chased down the target of 185 and scored 190/2 in 17.4 overs and won Comfortably. Their Opening batsman and wicket keeper N Jagadeesan scored 66*(50) & NS Chaturved 72(36), R Ashwin, J Kaushik and M Mohammed took one wicket each. R Rohit went for expensive 48 in his 4 overs with no wickets. VB Kanchi Veerans in a Must win situation. They lost back to back matches in TNPL 2018, this is a 3rd match for VBK against Dominating DD. VBK will look to open their winning account. We can expect many changes in batting order and bowling department. Their important Batsman and captain Baba Aparajith not batted well so far, His All rounder performance is more important for VBK to win this match. K Vishal Vaidhya is the only hope as a Opening Batsman for VBK, on the other hand S Siddharth went for ZERO in last two matches. Ravichandran Aswin (C), Jagannathan Kaushik, M Mohammed, Balchander Aniruth, Trilok Nag, NS Chaturved, Hari Nishanth, Ramalingam Rohit, Mohan Abinav, Adithya Arun, N Jagadeesan (WK), M Silambarasan, R Vivek, ME Yazh Arunmozhi, Nivethan Radhakrishnan, Ra Aravind, N Ramakrishnan, Varun Totadri, M Sujendran. Baba Aparajith (C), Aushik Srinivas, Sunil Sam, V Subramania Siva, S Siddharth, U Mukilesh, R Silambarasan, Sanjay Yadav, S Arun, K Vishal Vaidhya, P Francis Rokins, Suresh Lokeshwar (WK), K Deeban Lingesh, RS Mokit Hariharan, S Aswath, S Chandrashekar (WK), R Divakar, C Shriram, U Vishal. Ravi Ashwin will miss the match for National Duty. In previous match interview NS Chaturved said this is last match of R Ashwin. N Jagdeeshan will lead the team in his absence. M Silambarasan likely to replace R Ashwin in playing XI. N Jagdeeshan and H Nishanth will open the innings for Dindigul Dragons. R Rohit and Aditya Arun will lead the pace attack. Mohan Abhinav will lead their spin attack. They have retained only one player Baba Aparajith. Sandeep Warrier and Swapnil Singh are the two outstation players will be not playing. Apart from Vishal Vaidhya, Baba Aparajith, Subramania Silva no other batsmen did contribution for this team so it is headache for the captain to choose best plying XI after the huge loss in the previous match. S Siddhart failed to impress in the both matches so his place is doubtful. he scored 0, 0 runs in both matches. P Francis Rokins can replace U Mukilesh. R Silambarasan spent 89 runs in 6 overs in both matches, so his place is also doubtful. Sanjay Yadav and A Srinivas will lead the spin attack for VB Kanchi Veerans. Sunil Sam bowled well in previous match. N Jagadeesan (wk), C Hari Nishanth, NS Chaturved, B Anirudh, R Vivek, M Silambarasan/Trilok Nag, R Rohit, M Abinav, Adithya Arun, J Koushik, M Mohammed. K Vishal Vaidhya, S Siddharth, B Aparajith (C), P Francis Rokins/U Mukilesh, Subramania Siva, S Lokeshwar/S Chandrasekar (wk), Sanjay Yadav, S Ashwath, Sunil Sam, Aushik Srinivas, S Arun/R Divakar. – * doubtfull but opener batsmens. Captain and vice.-captain choices: N Jagadeesan, NS Chaturved, B Aparajith, Sanjay Yadav. If you liked DIN vs VBK preview, then follow us on Twitter for Latest Cricket News.